﻿ Glorious Chorus - acclaimed a capella choir led by Helen Yeomans, original songs with a message, sung with passion and commitment. The song playing is Helen’s arrangement of ‘Jerusalem’. You can watch Glorious Chorus perform this beautiful song at the bottom of this page. The music is available to buy on Helen’s website. See the choir take shoppers by surprise with their Try mashup performance - go to the News Page. Listen to the choir being featured on ‘The Choir’ where members of the choir talk about their times with Glorious Chorus by visiting the News Page. Helen’s prize-winning song has been arranged and performed by Ugandan youth choir Destiny Africa - see the News Page for more details. 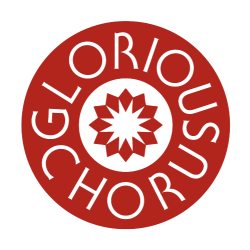 Exciting new season for Glorious Chorus! Glorious Chorus’s Summer 2019 diary is already filling up with some exciting new musical ventures. 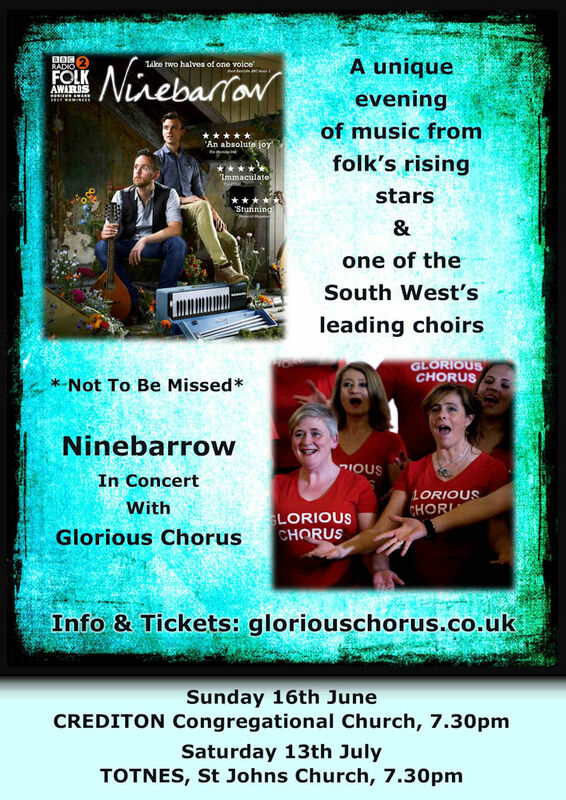 The choir is collaborating with BBC Radio 2 nominated folk duo ‘Ninebarrow’ with two concerts in June and July. 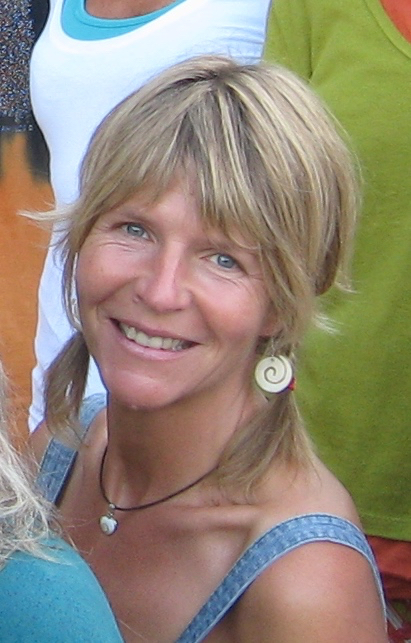 Helen will be writing new arrangements for the choir to sing with Ninebarrow on some of their songs. The dates and ticketing will be announced shortly. If you haven’t heard Ninebarrow yet, check out their exquisite music at www.ninebarrow.co.uk. Glorious Chorus is also performing at Plymouth’s Freedom Fields Festival in June. Watch this space for further announcements. If you want to book the choir contact Helen. Glorious Chorus at Voices Now! Glorious Chorus performed at the prestigious Voices Now festival at The Roundhouse, London on the weekend of 8th/9th July. The choir sang Line Groth's epic arrangement of Bjork’s Hyperballad with The Roundhouse Choir (the 1st public performance of this in the UK we believe) and Helen’s We Got All The Love opened the festival on Saturday night, sung by all choirs. Glorious Chorus performed at the festival’s Open Stages in Camden Market and The Roundhouse on the Sunday. Watch the new video of the choir’s trip to Voices Now here! Click on the video below (mute the Home Page audio player first). Helen has been announced winner of the gospel/faith category with her song ‘Saved' in the 2015 international songwriting competition. The competition attracts over 7,000 entries in total and is one of most prestigious songwriting contests in the world with several international winners in this year’s contest. Glorious Chorus will be performing this outstanding song next summer and you can find it on the Love, Peace & Harmony CD on the CD Shop Page. You can also see the choir perform it on the video below. For all info about the contest, visit uksongwritingcontest.co.uk. Glorious Chorus performs Helen’s beautiful arrangement of ‘Jerusalem' and her award-winning song 'Saved, featuring Fran Andre. For other footage videos of the choir, visit the Videos Page. Copyright © 2019 Helen Yeomans. All Rights Reserved.